JARO can manufacture your diner booth or banquette seating including matching stools, tables and wall art in this ever popular theme. JARO has a large selection of vinyl colours and some themed fabric suitable for this era. We can help you work out what you need or you can bring in your existing plans. The colour combinations are striking and will leave your customers talking. Colours include the standard reds & white through to lime green, yellow, pink, purple, orange and nearly every colour you can think of. Our solid frames are made to last and are covered with the best foams and vinyls suitable for heavy customer traffic. Our vinyls are commercial graded for durability, mould resistant and are easy to clean. For restaurants and other commercial venues we use fire retardant vinyls, foams etc as required to meet Australian standards and your insurance company's policies. Buyer beware as there are many cheap versions being sold without these regulations being met. 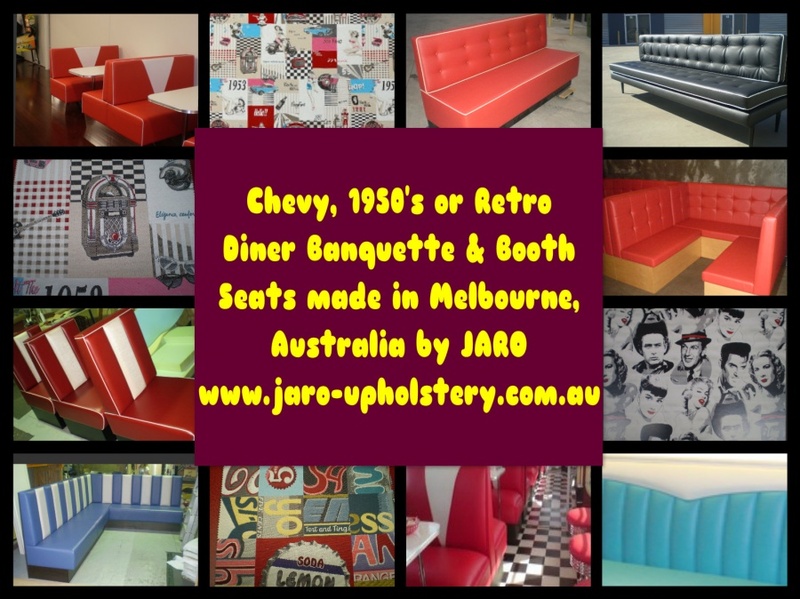 JARO would like to invite you to make a time to discuss your banquette and/or booth seat requirements or alternatively if you have any pictures, drawing or plans feel free to email them through to enquiries@jaro-upholstery.com.au for quoting purposes. If you would like to talk to us in person you may ring Jason on 0402 188238 or text/email through your contact details and we will endeavour to contact you as soon as possible. Weekend and after hour times are also available.